I have a confession to make. I’ve had the British Airways Visa Signature Card for over 3 years now and while I’ve earned the lucrative Travel Together Ticket, I’ve actually let it expire in the past without using it. I blame the elite hamster wheel (always trying to pay for flights for to retain my American Executive Platinum status and also bad premium cabin award availability on British Airways. I don’t feel bad about letting it go because I’ve extracted huge value out of the card without the benefit. You can earn the Travel Together Ticket by spending $30,000 on the card in a calendar year. Unlike most companion tickets, this one is used in combination with an award redemption instead of a paid fare. You still have to pay applicable taxes and fees for your companion, and since British Airways is notorious for high fuel surcharges, the Travel Together Ticket is best used in premium cabins. While you might pay $1,000 or more in fees per ticket for a first class redemption, it’s still a pretty great value considering those seats could easily cost you $10,000 apiece. Even if you would never pay the full fare first class ticket, it can be a great value. For example roundtrip NYC to London roundtrip in business class is 80,000 Avios and $1,000 in taxes/fees (that will shoot up by 50% April 28, fyi). With the Travel Together ticket you’d get two roundtrip business class tickets for the same total of 80,000 Avios and ~$2,000. In my opinion, 40,000 miles roundtrip each for a trans-Atlantic business class flight is pretty awesome- even if you have to pay $1,000. Nonetheless, I’ve always had an excuse; finding availability for two in premium cabins on British Airways can be tricky (especially as of late), and as someone who greatly values AAdvantage Executive Platinum status, I’d often rather buy discounted business or economy fares that earn miles and elite credits than spend thousands in fees and earn nothing. However, this year I was hell bent on not letting the Travel Together Ticket go to waste. British Airways recently announced plans to increase the cost of premium redemptions in April; Business and First class awards will go up by as much as 50%. The Travel Together Ticket could still be worthwhile after that, but the value proposition will surely decline. Anyone waiting to use the benefit would be wise to start looking for opportunities, so I decided to see if I could redeem for an early birthday trip to Europe. My birthday is March 7, and my ticket expires March 15 (so outbound travel has to be completed by then). The timing was perfect, and the hunt was on! Paris for my birthday? Yes, please. Photo Courtesy of Shutterstock. Ideally, I wanted to fly British Airways First class from Miami or New York to London, and then on to Paris or another favorite European capital like Amsterdam. Sadly, there was no availability to be found in First, and the only British Airways Business class availability was from another origin like Dallas or Chicago, which added a lot of travel time. Plus, I’d have to pay to get to those cities in the first place, so the value of the ticket diminished immensely. However, there was tons of award space on British Airways’ New York/Newark to Paris Orly service OpenSkies, which has a slightly outdated business and premium economy product, but offers convenient flight times and qualifies for the Travel Together ticket. 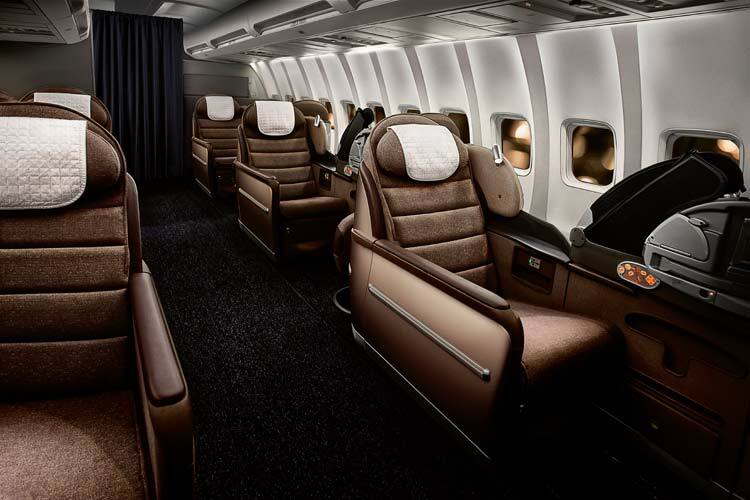 OpenSkies offers three classes of service: Biz Bed (Business), Prem Plus (Premium Economy), and Eco (economy). Biz Bed is a 20-seat cabin with 180° fully-flat beds, personal in-flight entertainment devices, and basically everything else you’d expect from transatlantic business class service. The OpenSkies Biz Bed reclines into a fully lie-flat bed. 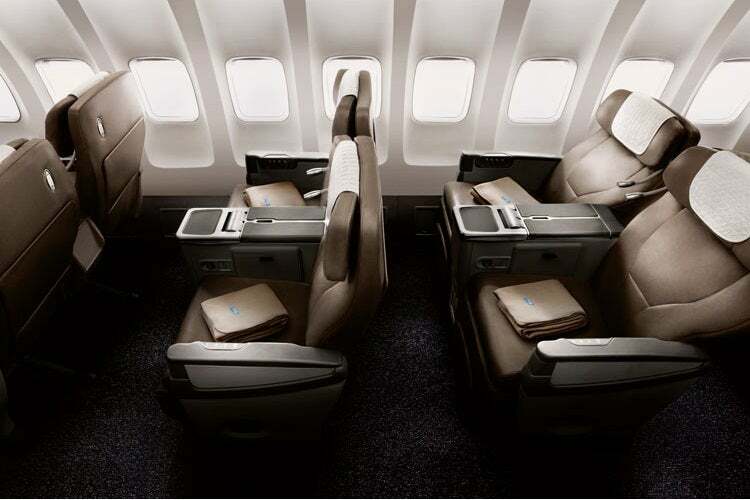 Prem Plus seats recline to 130°, and while they aren’t as spacious as Business class, they’re roomy for premium economy. OpenSkies Prem Plus is nicer than a lot of domestic business/first products. 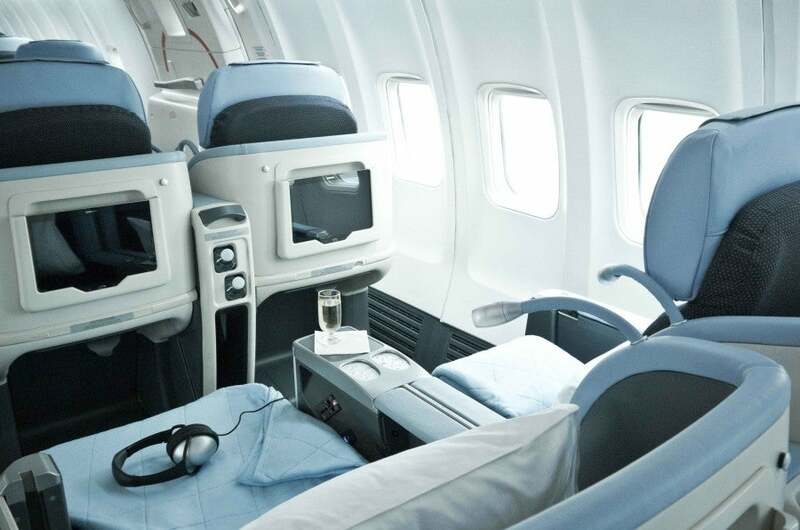 The entrance of La Compagnie to the NYC—Paris “semi-premium” market has put a downward pressure on prices, so OpenSkies sells advanced purchase tickets for $2,174. That’s much better than paying $5,000 on Delta or American, even if their business “beds” are fully flat and probably come with better food. I always like trying out new products, so I started doing some math to see whether using the Travel Together Ticket from the British Airways Visa made sense. That’s a grand total of 42,245 redeemable AAdvantage miles for a $2,174 trip. I value AAdvantage miles at 1.9 cents apiece, so those miles are worth $802, which is effectively a 40% rebate on a paid fare. That’s incredbile! Plus, I’d bank 7,298 Elite Qualifying Miles (over 7% of what I need to requalify for Executive Platinum) or 10,947 Elite Qualifying Points. Honestly, this would have been the optimal move in my situation. However, my boyfriend is coming with me, so for two tickets we’d be out over $4,300, and I’d be throwing away yet another Travel Together Ticket. So even though I wasn’t strictly maximizing my travel, I decided to forego the cash fare. If I have a good experience on OpenSkies, I’ll probably try it again later in the year because it’s so lucrative with the premium promotion! A pure Avios redemption would have been a pretty low value. Redeeming Avios normally on this route would cost 80,000 Avios and $1,024.50 per person. That’s almost half the price of buying the ticket outright, and with Avios redemptions you forego all mileage earning. In this case, 80,000 Avios would have saved me $1,150 (the price of the cash fare minus the amount paid in taxes and fees for the award redemption), so I’d get 1.4 cents per point in value (not taking into account the opportunity cost of miles not earned). That’s not horrible, but it’s not good. The Travel Together Ticket saved me about $2,300. Using the Travel Together Ticket for a round-trip would cost 80,000 Avios and $2,049. The companion ticket negates the Avios needed for the second ticket, but I still have to pay taxes and fees. Two tickets paid for in cash would cost $4,348, but with the Travel Together Ticket, I could redeem 80,000 Avios to save $2,299 out of pocket. That’s a value of about 2.9 cents per point. Even after factoring in the $802 in value I would earn in mileage on a paid fare, I’m still getting better than 1.9 cents per point. That’s not amazing, but it’s pretty good. In the interest of trying a new product and toying with the value of the Travel Together ticket, I decided to only use the ticket for the outbound trip (you can use the Travel Together ticket for one-ways,but you need to do it on the outbound US segment), and to fly home on La Compagnie — especially since La Compagnie leaves at 5 pm on Sunday, giving me more time in Paris (one of my favorite cities). Thus, I was able to only use 40,000 Avios + $911 for two one-way business class tickets between EWR and ORY on Openskies. I used the Travel Together Ticket on my outbound trip, spending 40,000 Avios and $911 total for two business class fares. I then paid $1,135 each for one-way business class tickets on La Compagnie. 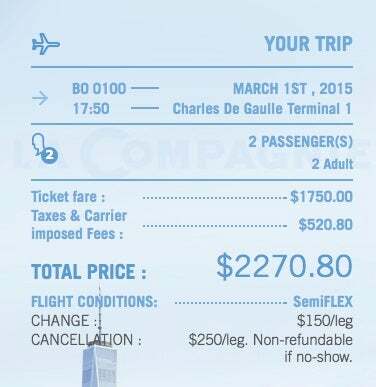 The bill for the return flight on La Compagnie. While I won’t earn miles on those tickets, and strictly speaking it would have made a lot more sense to pay for Openskies and bank the AA miles, I am a travel writer and I think it will be valuable to TPG readers for me to review this interesting new airline startup. How bad could 8+ hours on a 757 in a “unique” business class really be?! I’ll let you know soon. While it wasn’t the most lucrative option, I’m looking forward to trying out La Compagnie. To be thorough, I also looked into buying premium economy tickets on OpenSkies Prem Plus and upgrading using Avios. The total was $1,985 and 20,000 Avios, which made no sense given that I could buy business class seats outright for $2,174. I’d be getting a redemption value of less than one cent apiece for my Avios, which is pretty dismal. The lesson there is to always do the math, and save your points for when they offer the most value. Buying premium economy fares and upgrading with Avios was a terrible value. The Travel Together Ticket from the British Airways Visa offers significant value in premium classes. If you’re currently sitting on one you earned in the past year, I’d put it to use on some business or first class awards before the impending devaluation on April 28, 2015. While you must book before that date in order to pay the lower redemption rate, your award can involve travel after that date, so even if you’re not planning to fly until later in the year, the Travel Together Ticket is still an option. Always run the numbers to see if it makes sense to redeem Avios outright, use the Travel Together Ticket, or pay for flights if rates are favorable. Know that you can use the companion ticket for one-way travel as well, you just have to leave from the US. I’d love to hear about your experiences using the Travel Together Ticket, so please share your stories in the comments below!